Here discover articles, obscure reference and many entry for Dictionnary. This book about programming macintosh for old system (system 7) has a reference for Clarus on its cover. 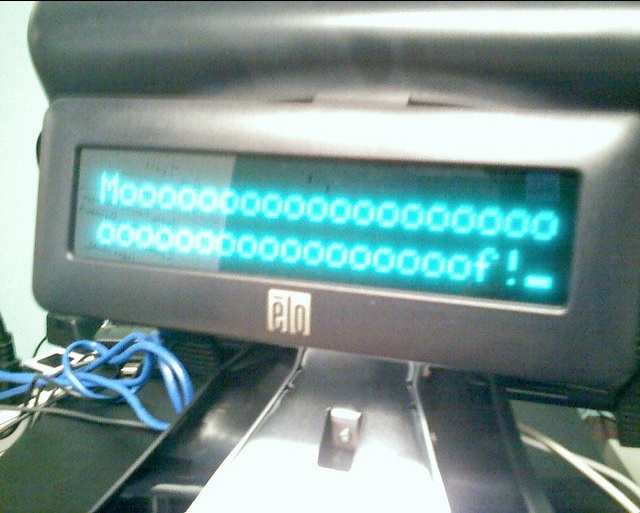 A dogcow say "Moof!" hitting by a young boy and its skateboard. Keith Rollin explain in CMSP. "On the spine is an inverted picture of the dogcow. That's the Anti-dogcow, which seemed the appropriate logo for two ex-DTS workers (the dogcow is the mascot of Mac DTS)." "Jess is on a skateboard for no really good reason. On the skateboard with him is the surfer dude from the cover of Inside Mac VI (he's the icon for the SurfWriter application alluded to in examples inside IM VI). They've just hit Clarus the dogcow, which is why he'd flying up in the air. (I actually have a different theory on why Clarus is in the middle of the air. When I worked in DTS, the term we used for developers who had just done something really stupid is "grazing off the cliff." I'm of the feeling that Clarus just grazed off the edge of the desk.)" 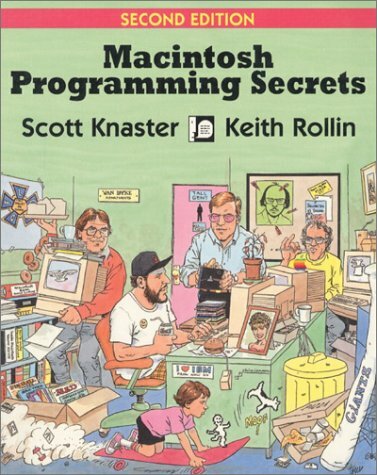 Jim Trudeau wrote a book for beginner in programming for Macintosh. Beside it was a valuable material, the book contain a section about "Clarus, the Dogcow", the first section of the first chapter. "Allow me to introduce a friend of mine. I’d like you to meet Clarus, the dogcow. You can see her picture in Figure 1.1. Do not be dismayed by her pixelated appearance. That’s what Clarus looks like. Clarus is, after all, a dogcow. Clarus is the mascot of Apple’s Developer Technical Support and a trademark of Apple Computer. In fact, everything Clarus has ever said is also a trademark. Clarus is an almost mythical figure in the Macintosh developer community. While many have seen her picture, true sightings of our friend are quite rare. It’s rumored that Elvis took lessons from Clarus before going into hiding. All the same, her presence lives in every Macintosh. Her image was captured by Susan Kare and included in the Cairo font that shipped with the very first Macintosh. She was sighted again and named on October 15, 1987 by Scott “Zz” Zimmerman. He and Mark Harlan made her existence known to the rest of the world. It is rumored that she was captured once in a Microsoft advertisement, but she escaped as soon as she could. Scholarly Macintosh programming journals have published articles about Clarus. She has wandered into an official Macintosh technical note. Clarus even has a nest on the internet’s world-wide web where you can hear her speak and become steeped in dogcow lore. Because she is two-dimensional, Clarus can face predators head-on to avoid being seen. This may explain why Clarus can fit inside your computer. She might even be standing next to you and yet remain invisible. No wonder Elvis consulted her! You encounter this light-hearted spirit throughout the Macintosh development community. Some have us believe that Clarus is a semi-official creation of a major corporation. Independent Macintosh programmers know that although she is a trademark, Clarus was discovered, not invented." ATPM was a monthly internet magazine (e-zine) created in 1992. The last issue was 2012... ATPM was focus on Apple Macintosh. 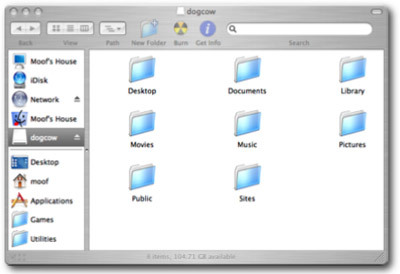 ATPM 4.08 (1998) : Welcome, the author talk about buzz arounf Apple retiring Clarus, the DogCow... In fact he was true ! ATPM 7.06 (2001) : A link the the petition "Save the dogcow"
ATPM 9.09 (2003) : Hello Again, Angus Wong told us his personal computer history, and has 2 references to Clarus : Cairo Shoot (game) and "Moof!" ATPM 12.09 (2006) : Colmuns bloggable, discuss about high resolution display and compare old icon (16x16 or 32x32 pixels) to now 256x256 pixels ones. His sample was Dogcow design by Susan Kare. 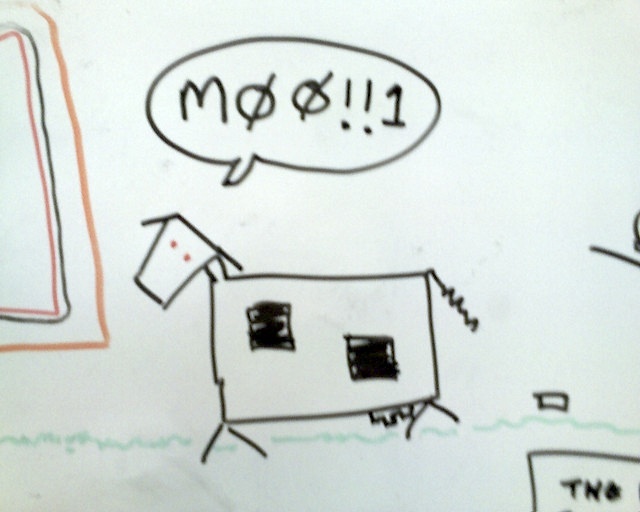 Note that origonal Dogcow in Cairo is 26x22 pixels ! 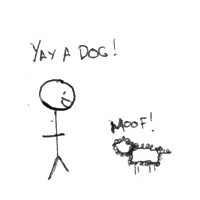 Jane create dogcow entry in wikipedia on 2nd febrary 2004. 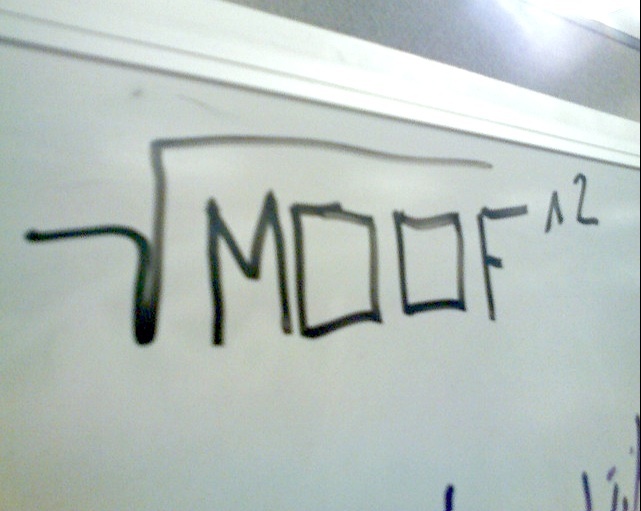 "What is the square root of moof squared? 42?" 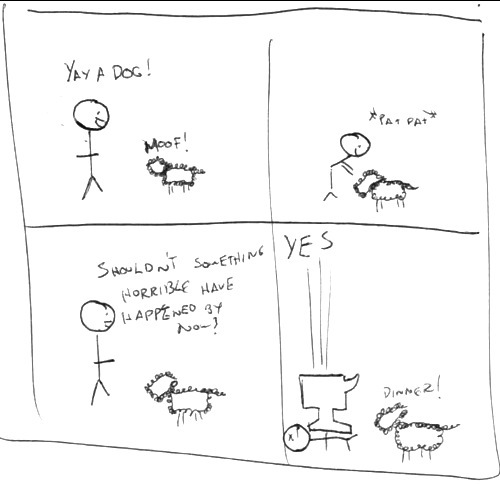 Jan-Yan made small comics published on its flickr account. 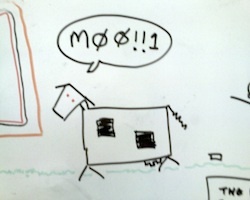 One envolve a strange creature that "moof !"... But the title is explicit it's not a dogcow : "No it's not a dogcow, it just an identity problem"
LCD display elo, displaying "Mooooooof!" Mr Kubasiak wrote a guide for forensic examination of a macintosh... It describe boot process, target disk boot, daemon and so on. Very technical document, but Mr Kubasiak seems to be also a Mac geek... 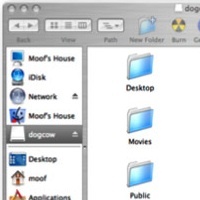 The example shown to illustrate envole a mac with an hard drive named "Moof's house", the sample user name is "moof" and an external support is "dogcow". Erica wrote a small article about Clarus, but well written. Flickr made an april fool on 2012 : all flickr account were displayed using a strict black & white (1 bit)... Vanessa love this and ask flickr to let this feature active... She was also a clarus fan : "Dear Flickr, I LOVE this April Fool's joke. Please, for the love of the Dogcow, leave it active after today!" Remember TechNote 31 was dated 1st april 1989 ! 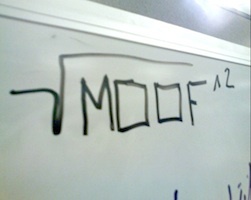 Most materials (pictures, icons, movies or sounds) are copyright by their original authors - Dogcow logo and Moof! are perhaps trademark by Apple Computer Inc.